Emmaus Church meets on a Sunday morning from 10:30am - 12:00am. 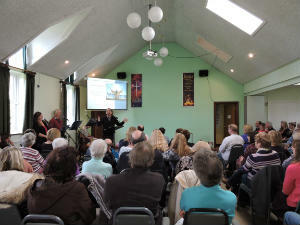 We meet for a service that includes a mixture of well-known and modern hymns and songs, prayer, and a Bible based talk. One the first Sunday of each month we share Communion. The service ends with tea, coffee and a chance to make new friends. You would be most welcome to join us. Children are welcome and provided for in Kidspace and Creche if accompanied by an adult. This is a place for the children to learn about God and the Bible in a way that is accessible and relevant for them. Every fortnight a Breakfast Club runs concurrently with our Sunday Morning Service. It begins at 10am with breakfast for everyone and quiz sheets and colouring for the children. We start the service together before the children go to their activities which include stories, games, songs and a DVD followed by huge a choice of craft. All age children are welcome with parents/grandparents. During the week we run three homegroups on a Tuesday or Wednesday at various homes in Severn Beach and Pilning. Each Group is different with its own leader.